Prof. Narayana Rao KVSS’s Lecture is a Big Hit at the Annual Conference of IISE 2017, held at Pittsburgh, PA, USA. neighborhood, off Porvenir Avenue. By now the procedure is habitual. GAESA in businesses run by Eusebio Leal, the City Historian. the armed forces, in Rancho Boyeros. ultimately asked them to collaborate with the special services. president appointed by his brother Fidel. executive and the secret services. the equipment of free journalists is multiplied. Otro18 (Another 2018), they are also repressed. to be 'interviewed' by the counterintelligence officials. I promise to keep you informed. are always enough funds in military's coffers to write a blank check. 35% of the nation's paltry GDP. detention in damp, filthy jail cells. former intelligence officer with experience listening in. dissidents — are those in the world of arts and letters and the sciences. government offices and newsrooms they appear to be loyal to the system. managers, officials and employees of important state institutions. adept at using physical and verbal violence than intellectual arguments." as a political refugee and who was also an independent journalist. Tania would threaten him with a ceramic mug and he would flee the scene. Reloj Club on Boyeros Avenue by officials from Military Counterintelligence. whom they suspected of being sources for my articles. police station in Havana's Lawton district. not promise tolerance, they did remain silent. near the police station in Lawton where I had been questioned. journalists and human rights activists. vice-president of the Inter-American Press Society. But I fear that democracy is not one of the Cuban regime's top priorities. channels but new for Cuban TV. The channel's news director, Ovidio Cabrera, showed me around the station. that's on air for 18 hours a day," says Mr Cabrera. "And the vast majority of our coverage, around two-thirds, will be live." particularly innovative, but in Cuba such changes happen slowly. Granma, has barely changed its typeface in 50 years of revolution. I can't say 'changed' exactly - but certainly made more flexible." believes that Canal Caribe is evidence of changing media attitudes in Cuba. what is representative of the Cuban people," he says. The way Cubans are consuming their news is undoubtedly changing. than tune into the nightly news. they will find it hard to engage the island's youth. homes and theoretically should soon become more widely available. being perceived as dangerous by the authorities may now be numbered. broadly optimistic about the future of the island's connectivity. journalists is preparing to broadcast live again. aware that the slogans of the past no longer appeal to many young people. payments and right now we're waiting on three more payments," they explain. the money to the Airbnb hosts. an isolated case "because the whole world is in the same situation." full amount at once" and that is why they prefer to "make partial payments." with a welcome card she makes herself. She says that Airbnb always makes the payment "in less than two days"
"the type of clients that you ask for." guarantees me the seriousness of the customer," says Monzó. found in any branch of the state-owned company Financiera Cimex. "You can ask VaCuba to start sending the money to the AIS card,"
are levied even when their rooms are not rented. and embarking on some significant economic reforms. " nothing turned out as it should have turned out." who goes down in history with that note in his biography." been "a step back, a retreat, an excess of control" for the private sector. on every important public act to see who is who and who is not." the opportunity to amend the course of the Revolution." of society other than flight or repression." [multiple] parties and stop repressing the population." were not done before and were unthinkable to do." system, which aren't even mentioned in the Party Guidelines," he says. the ministers have been there 10 years." Anastasia Steele, the yielding girl in Fifty Shades of Grey. "too old to rock and roll, too young to die." context—conducting a serious search through the totality of the content." in the UJC nor the PCC. vertical discipline… when they give me a way, there will be a will." opened its services in Cuba. economics who rents out a house in the town of Soroa, Artemisa. accommodation is described as "rustic" and in direct contact with nature. rental options that Airbnb claims exist on the island. the diplomatic thaw between Washington and Havana. a minibar are some of the options to choose from. spaces. An unknown number offer a house or a room "under the table,"
without a state license and without paying taxes. accommodation through the company's website. visitors initially forecast, according to the Ministry of Tourism (Mintur). growing in the history of the company. the new customers "are much better, more serious and more respectful,"
and "they pay more," he summarizes. she receives a reservation message is complicated. she already has another confirmed reservation. wholesale market in the country." to family on the island. just thinking I'd like to have a well-stocked refrigerator." month; physicians earn roughly $60 a month. and civic activism have successfully developed over the last decade. defined as "a blog of the vanguard Cuban youth." consistent with the codes of youth," and "stipped of all formalism." and defense of the best values of the Revolution." they acquire through informal distribution networks. indifference of users to official initiatives and mass organizations. La Unión de Jóvenes Comunistas (UJC) se ha sumado a la blogósfera nacional, según informa este miércoles el diario Juventud Rebelde. El joven cubano llega con diez años de retraso al mundo de los blogs, que la oposición, el periodismo independiente y el activismo cívico han desarrollado con éxito en los últimos diez años. Los gestores del nuevo sitio digital buscan convertirlo en "otra alternativa" para que los internautas participen en un "escenario de debates y exposiciones de criterios", asegura el medio oficial. 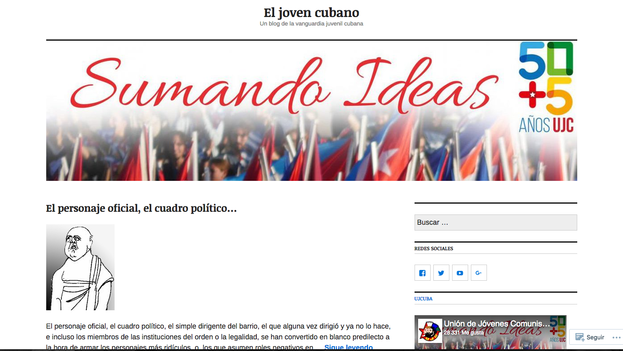 Está alojado en la plataforma gratuita de Wordpress y se define como "un blog de la vanguardia juvenil cubana". Asael Alonso Tirado, funcionario del Comité Nacional de la UJC, aclaró que el espacio apuesta por "un lenguaje fresco y acorde a los códigos juveniles" y "despojado de todo formalismo". No obstante, aclaró que en los debates debe primar "el respeto y la defensa de los mejores valores de la Revolución". El funcionario se muestra optimista y asegura que el espacio cuenta con 31.500 seguidores y ha logrado "en menos de cinco días casi 1.000 visitas, principalmente desde Cuba, Estados Unidos, Brasil, Argentina, Venezuela, Ecuador, Chile, Namibia y Angola". [[QUOTE:El Joven cubano se inserta en una tendencia oficial de competir con los más importantes servicios y redes sociales de internet]]Sin embargo, el blog de la UJC aterriza en una enmarañada jungla de espacios digitales que ganan presencia en la Isla a pesar de la baja conectividad a la red de redes. La mayoría de los jóvenes consume contenido que obtiene a través de la redes informales de distribución. El Joven cubano se inserta en una tendencia oficial de competir con los más importantes servicios y redes sociales de internet. Entre ellos destaca Ecured, que busca rivalizar con la enciclopedia participativa Wikipedia; Reflejos, similar a servicios de alojamiento de bitácoras como Blogger; La Tendedera, que intenta competir con Facebook, y el sustituto del paquete ilegal de audiovisuales, apodado la mochila. Ninguna de esas copias ha logrado la popularidad de sus originales, por lo que habrá que esperar para comprobar si el nuevo blog de la UJC supera la indiferencia de los usuarios ante las iniciativas oficiales y de las organizaciones de masas.